A crocheted pouch or bag is most useful if it has a fabric lining. Without a lining, things could come poking out through the bag, and you certainly don't want that to happen. This tutorial will show you one easy method for how to sew a lining for your rectangular-shaped pouch or bag. 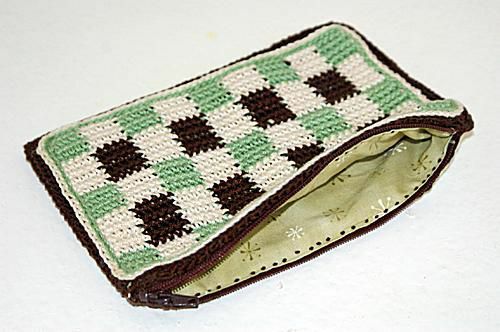 I'm demonstrating this method on the checkerboard crochet pouch, pictured above. You can adapt it for use on just about any pouch or bag as long as it is a rectangle or square shape. If you'd like to whip up a crocheted pouch to practice on, please be sure to visit our list of free pouch patterns. You might also want to take a look at our list of free bag patterns as well. You'll want to start with a crocheted pouch or bag where the two rectangular or square pieces have been stitched together down the side, across the bottom, and up the other side. Do not add purse handles or the zipper until after the lining has been completed. Aside from your crocheted pouch, you'll need the following materials for adding the lining. Fabric -- woven fabric works best, in my experience. A sewing machine is optional but really helpful. Press your fabric nicely so that it does not have any wrinkles. Create a template out of paper, cardboard or acrylic that measures 1/2" wider than your pouch plus 1/4" higher. This allows for your seam allowances on the sides and bottom edges of the pouch. Using your template, cut out two identical pieces of lining fabric. Keep in mind that, when you open the pouch, you'll want to be peeking in at the printed side of the lining. So, when you sew the pieces together, you want to put the right sides facing each other, so they are turned inwards. There are a couple of different ways you could proceed from here. Pictured Above: Stitch around the side, bottom and other side using a 1/2" seam allowance. An Alternate Method (Not Pictured): Leave a bit unstitched at both upper edges, but otherwise stitch all the way around the side, bottom and other side as pictured above. In a later step, you will be turning the upper edges down, and if you leave a bit unstitched it will help make that part of the process easier. The downside is that it's hard to know precisely how much to leave unstitched. In my sample project, the unstitched length should've been about 3/8 of an inch, but your project might require a slightly different measurement. Using scissors, clip both of the lower corners diagonally, cutting through both layers of fabric. Turn the seams up and press them using a hot iron so they stay in place. I usually do this on one side at a time. Here's How the Lining Looks with the Seams Pressed. Clip off the Excess Triangles of Fabric. Insert the Lining Into the Pouch. The lining extends above the top of the pouch. Mine is about 3/8 inches taller than the pouch. Fold this excess amount down to the wrong sides so that it will be hidden inside the pouch. You may need to clip the side seam a bit to accomplish this, especially if you stitched all the way around without leaving a bit unstitched at the upper edges. Pin the zipper to the pouch and stitch it in place on one side. Open the zipper, then pin it in place and stitch it to the other side. If there are any areas on the sides that are still opened, stitch them closed. If you're making a pouch, the pouch is now ready to be filled. Have fun using it, or giving it as a gift! If you're making a bag, you're now at the point where you can add the purse handles to finish it. Here's How the Pouch Looks After the Zipper Has Been Added.